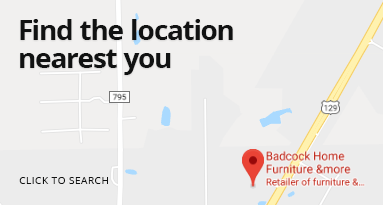 At our Badcock Home Furniture &more store in Sumter, South Carolina, our we provide customers with stylish home furniture and quality appliances. We believe everyone deserves a beautifully furnished home, regardless of budget. We offer in-house financing and easy payment plans to fit your needs. Our store is nestled between the Sumter Mall and the U.S. Social Security Administration at 230 Bultman Drive Sumter, South Carolina 29150. We are open Monday through Friday 9:00 a.m.- 7:00 p.m., Saturday 9:00 a.m.- 6:00 p.m. and Sunday 12:00 p.m. - 5:00 p.m. For more information, call us at (803) 778-5155. Here in Sumter, we make it easy to get the furniture you've been dreaming of at an affordable price. Stop in and see us today!